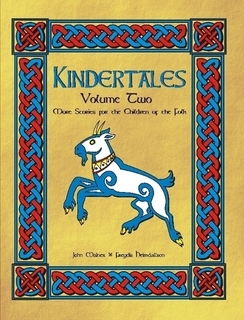 Kindertales has appealing cover art: a prancing goat and an all-round knotwork pattern in red and blue. Additionally, each story a features a black-and-white drawing. Big font and good line spacing make for comfortable reading — and especially reading aloud — of the eight stories, of which I´ll try not to give too much away. “Thor´s Troll-Goat” narrates an unusual encounter during one of Thor´s excursions on his chariot with Thialfi and Roskva. The humorous story centers on taking responsibility for one´s actions, and making appropiate amends … even when it´s not easy! “The Lay of Goldenlocks and the Three Bears” conveys the well-known fairy tale in unrhymed four-line stanzas, and places emphasis on hospitality and a guest’s rights and duties. “Vargus the Vegetarian Troll” is a very original tale of an orphaned troll child´s quest for his identity, religion, and finding kinship outside of his troll-race, which is dwindling due to man´s expansion. Finding acceptance among his new chosen family, the Aesir, proves quite hard for various reasons … including the need for a radical change of diet! The plot also demonstrates the dangers of being an overweight, lazy youngster in the vicinity of a lapsing troll …. In “Wolf and Word”, we learn about Fenris’ growing danger, his binding, and the central decision that even (or especially) for a warrior, it´s more important to keep your honor than your hand. “Snjóa” is none other than Snow White, but told so differently in plot and style that it has become a story well in its own right. It has the ring of a true folk tale rather than of a fairy tale. Again, one of the themes is doing the right thing: in this case paying off an old debt. The “Draugr of Hudiksvall” sleeps soundly in his barrow until Thorgerd´s cheeky young brother decides to steal his sword right off his chest just for the fun of it. This, of course, cannot go unavenged, and soon both siblings and the reader experience the fine chill of a Norse horror story in the best manner of “The Waking of Angantyr”. The resolution is achieved through courage, fast wits, negotiation skill, and a strong sense of honor. Honoring an ancestor by recounting their deeds and names, and keeping one´s word throughout the years – again, heathen customs and values are smoothly woven into and explained by the story. “Gifts” expands upon the perhaps best known heathen tenet, eg, a gift calls for a gift. Karl saves a young rabbit´s life, and the next winter finds the rabbit in a position to help Karl and his kin in return. Lastly, “The Story of the Mistletoe” not only tells of Balder´s death, but also of Mistletoe´s unwitting denial to join the non-aggression pact, the shattering realization of the consequences, and the offered wergild to replace part of what was lost. All characters are portrayed sympathetically and convincing; the dialogue is lively. The use of Norse names and expressions roots the stories firmly in the northern regions. The pronounciation of “Snjóa” or “Vajbjorn”, and unusual letters like ð and ü might prove a challenge for reading children, or for adults reading it the first time aloud. “Vargus” partly features rhyming couplets within the flow of the prose text. Many tales are recounted with a smaller or greater hint of archaic diction, which adds to the folktale feeling, but again might be challenging to younger children, especially in “Vargus”. Each story is entertaining and at the same time conveys its own message and lesson, thus unobtrusively furthering a heathen mindset, including a good measure of common sense. This book is well suited to being read aloud. During reading, depending on the child´s age and background knowledge of the mythology, perhaps the wording should be modified in some places, or supplemented with explanations (as certainly is par for the course for any children’s tale.) Like its predecessor Kindertales Volume One: Stories Old and New for the Children of the Folk, the new Kindertales Volume Two makes a fine addition to a heathen´s library — especially, but not only for parents.